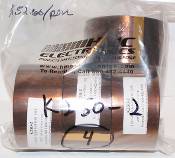 High-temperature film tape that withstands temperatures up to 500°F. Used for electrical and thermal insulation and, in particular, in the masking of gold fingers on circuit boards during wave soldering. Amber, 2.5-mil thick tape has a heat-resistant silicone adhesive. Any Burning of adhesive forms a non-conductive ash. Price Includes (4) Rolls of tape, and Free Shipping to any USA destination!